When I say that I live on the urban/rural edge, I really mean it. Our house is in a neighborhood, we have city water, sewer, etc., and it only takes ten minutes on city streets to reach downtown. However, due to the large lots, acequia systems, county distinction that allows for lot of farm animals per acre, we have a lot of nature at hand too. I've found and collected all kinds of interesting natural things from around the property-- crawdad claws (they come from the ditch), desiccated lizards (crawled into a poster tube in my mud room and apparently couldn't get out again), pieces of wood with perfectly circular holes bored by woodpeckers, all kinds of feathers from common doves to pheasant tail feathers, but what I found today might take the cake. Seriously, is that the most phallic mushroom you've ever seen? It was even wet on the tip. I have no idea what kind of mushroom that is, but it was just growing out of the front lawn. Nature is really amazing sometimes. Update: It really is phallic... 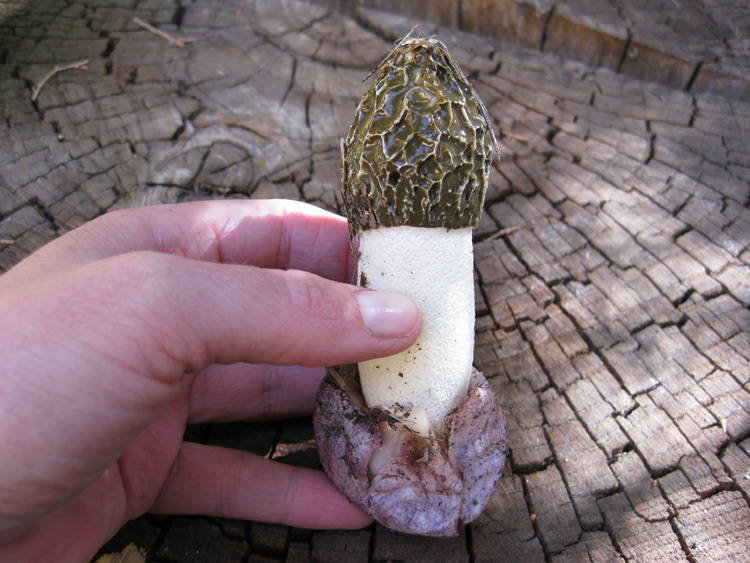 I think it's most likely a Phallus impudicus, or Common Stinkhorn mushroom. It did have a distinct odor, although I wouldn't say it stunk. It mostly just smelled mushroom-y.